Today an article was published in the local paper about AVID and the upcoming AVID job fair. Mr. Duez and Ms. Tibbetts (seen in the picture to the right) were quoted a few times in the story. I think the author Mike Morris did a GREAT job. He captured AVID perfectly. Thanks to him for helping us get the word out about the program and finding tutors to help our kids. The Humble Independent School District will hold a job fair on Aug. 12 for tutors interesting in assisting its AVID program, an effort aimed at helping students reach their full academic potential. The program, Advancement Via Individual Determination, targets students who are capable of challenging themselves in school but may not be doing so. These kids are then enrolled in honors courses and supported with small-group tutoring and a study-skills curriculum. The ultimate goal is success at a four-year university. AVID, starting its fourth year in Humble ISD, is now offered as an elective class in every middle and high school. Central to the effort are the college and some advanced high school students who visit AVID classes twice each week to tutor small groups of pupils as they transition to tougher coursework. The job fair will be held 3:30 to 5:30 p.m. in the board room at the Administration Building, 20200 Eastway Village Drive. All tutors receive 16 hours of training in AVID techniques, and are paid for their time. Returning tutor Raisa Byers, 21, a student at Houston Baptist University, said the work involves some social guidance as well as academic counseling. Byers and her 80 or so fellow tutors across the district work with four to seven kids in each AVID class. Their students must come to each session with at least two questions about their coursework. 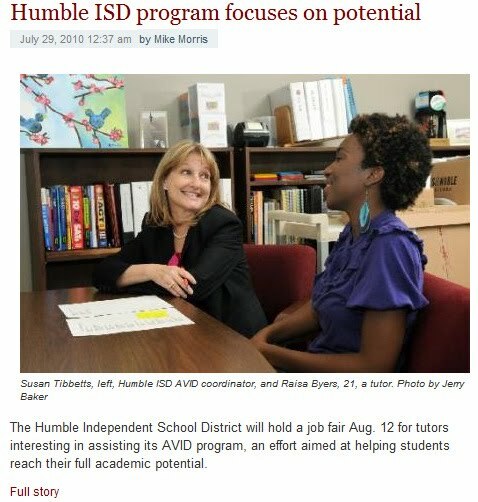 The tutoring is about collaboration, not giving hints, said Susan Tibbetts, who coordinates the AVID program throughout Humble ISD. This approach appears to be working. Sixty percent of AVID graduates enroll in four-year colleges, according to the Humble ISD figures. Another third initially enroll in community colleges; many later transition to four-year schools, Tibbetts said. Almost 90 percent of AVID graduates who enroll in college graduate. This success doesn’t happen magically, however. Supporting the students is a lot of work, said David Duez, an Atascocita High School history and AVID teacher. Not only do AVID teachers work closely with the students for four years, counseling them through hard times personally and academically, Duez said, but AVID teachers also must monitor all of their 60 or more AVID students’ grades. “Teachers come to me and they say, ‘What’s going on with Billy?’ or, ‘What’s going on with José?’ They want to know that from me before they even call home,” Duez said. Despite the taxing transition to a more emotionally demanding role, Duez said the aim of the program and the success it fosters keep him motivated. He would have been an AVID kid growing up, he said.